The liver is an accessory digestive gland that produces bile, an alkaline compound which helps the breakdown of fat. Bile aids in digestion via the emulsification of lipids. 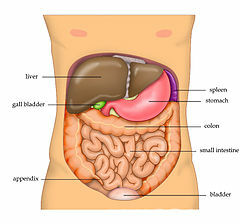 The gallbladder, a small pouch that sits just under the liver, stores bile produced by the liver. The liver's highly specialized tissue consisting of mostly hepatocytes regulates a wide variety of high-volume biochemical reactions, including the synthesis and breakdown of small and complex molecules, many of which are necessary for normal vital functions. Estimates regarding the organ's total number of functions vary, but textbooks generally cite it being around 500. No way is yet known to compensate for the absence of liver function in the long term, although liver dialysis techniques can be used in the short term. Artificial livers are yet to be developed to promote long-term replacement in the absence of the liver. As of 2017[update], liver transplantation is the only option for complete liver failure. 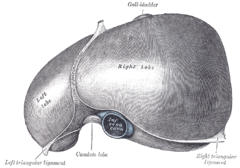 The liver is a reddish-brown, wedge-shaped organ with four lobes of unequal size and shape. 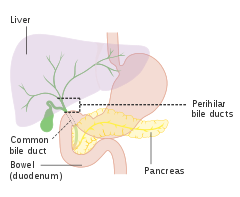 A human liver normally weighs 1.44–1.66 kg (3.2–3.7 lb), and has a width of about 15 cm. It is both the heaviest internal organ and the largest gland in the human body. Located in the right upper quadrant of the abdominal cavity, it rests just below the diaphragm, to the right of the stomach and overlies the gallbladder. 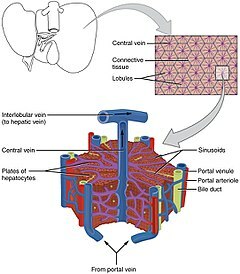 The liver is connected to two large blood vessels: the hepatic artery and the portal vein. The hepatic artery carries oxygen-rich blood from the aorta, whereas the portal vein carries blood rich in digested nutrients from the entire gastrointestinal tract and also from the spleen and pancreas. These blood vessels subdivide into small capillaries known as liver sinusoids, which then lead to lobules. 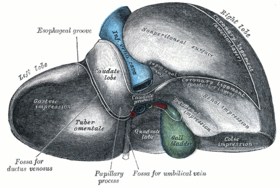 The falciform ligament, divides the liver into a left and right lobe. From below, the two additional lobes are located between the right and left lobes, one in front of the other. A line can be imagined running from the left of the vena cava and all the way forward to divide the liver and gallbladder into two halves. This line is called "Cantlie's line". The hilar area of the liver is described in terms of three plates that contain the bile ducts and blood vessels. The contents of the whole plate system are surrounded by a sheath. 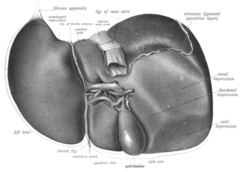 The three plates are the hilar plate, the cystic plate and the umbilical plate and the plate system is the site of the many anatomical variations to be found in the liver. At birth, the liver comprises roughly 4% of body weight and weighs on average 120 g. Over the course of further development, it will increase to 1.4–1.6 kg but will only take up 2.5–3.5% of body weight. The various functions of the liver are carried out by the liver cells or hepatocytes. The liver is thought to be responsible for up to 500 separate functions, usually in combination with other systems and organs. Currently, no artificial organ or device is capable of reproducing all the functions of the liver. Some functions can be carried out by liver dialysis, an experimental treatment for liver failure. The liver receives a dual blood supply from the hepatic portal vein and hepatic arteries. The hepatic portal vein delivers around 75% of the liver's blood supply, and carries venous blood drained from the spleen, gastrointestinal tract, and its associated organs. The hepatic arteries supply arterial blood to the liver, accounting for the remaining quarter of its blood flow. Oxygen is provided from both sources; about half of the liver's oxygen demand is met by the hepatic portal vein, and half is met by the hepatic arteries. The biliary tract is derived from the branches of the bile ducts. The biliary tract, also known as the biliary tree, is the path by which bile is secreted by the liver then transported to the first part of the small intestine, the duodenum. The bile produced in the liver is collected in bile canaliculi, small grooves between the faces of adjacent hepatocytes. The canaliculi radiate to the edge of the liver lobule, where they merge to form bile ducts. Within the liver, these ducts are termed intrahepatic bile ducts, and once they exit the liver, they are considered extrahepatic. The intrahepatic ducts eventually drain into the right and left hepatic ducts, which exit the liver at the transverse fissure, and merge to form the common hepatic duct. The cystic duct from the gallbladder joins with the common hepatic duct to form the common bile duct. Hepatitis is a common condition of inflammation of the liver. The most usual cause of this is viral, and the most common of these infections are hepatitis A, B, C, D, and E. Some of these infections are sexually transmitted. Inflammation can also be caused by other viruses in the family Herpesviridae such as the herpes simplex virus. Chronic (rather than acute) infection with hepatitis B virus or hepatitis C virus is the main cause of liver cancer. Globally, about 248 million individuals are chronically infected with HBV (with 843,724 in the U.S.) and 142 million are chronically infected with HCV (with 2.7 million in the U.S.). Globally there are about 114 million and 20 million cases of hepatitis A and hepatitis E respectively, but these generally resolve, and do not become chronic (see Hepatitis A, Hepatitis E). Hepatitis D virus is a "satellite" of hepatitis B virus (can only infect in the presence of hepatitis B), and co-infects nearly 20 million people with hepatitis B, globally (see Hepatitis D). On November 26, 1987, the city of Ferrol, Spain, inaugurated what is believed to be the only monument to the liver in the world. The then-mayor, Jaime Quintanilla, also happened to be a doctor, and thought it appropriate to promote the monument. At an approximate cost of $3.200, the monument stands in the village of Balón. A plaque reads (In Galician, free translation): "The Liver [is the] basis of Life", and below "Through History, Mankind tried to cure all illness. By helping it on this duty, you are doing a great job. We are grateful for it". Liver can be baked, boiled, broiled, fried, stir-fried, or eaten raw (asbeh nayeh or sawda naye in Lebanese cuisine, or liver sashimi in Japanese cuisine. 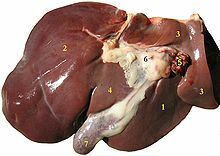 In many preparations, pieces of liver are combined with pieces of meat or kidneys, like in the various forms of Middle Eastern mixed grill (e.g. meurav Yerushalmi). Well-known examples include liver pâté, foie gras, chopped liver, and leverpastej. Liver sausages such as Braunschweiger and liverwurst are also a valued meal. Liver sausages may also be used as spreads. A traditional South African delicacy, namely skilpadjies, is made of minced lamb's liver wrapped in netvet (caul fat), and grilled over an open fire. Animal livers are rich in iron, vitamin A and vitamin B12, and cod liver oil is commonly used as a dietary supplement. Traditionally, some fish livers were valued as food, especially the stingray liver. It was used to prepare delicacies, such as poached skate liver on toast in England, as well as the beignets de foie de raie and foie de raie en croute in French cuisine. ^ Abdel-Misih, Sherif R. Z.; Bloomston, Mark (2010). "Liver Anatomy". Surgical Clinics of North America. 90 (4): 643–53. doi:10.1016/j.suc.2010.04.017. PMC 4038911  . PMID 20637938. ^ a b Kawarada, Y; Das, BC; Taoka, H (2000). "Anatomy of the hepatic hilar area: the plate system". Journal of Hepato-Biliary-Pancreatic Surgery. 7 (6): 580–6. doi:10.1007/s005340050237. PMID 11180890. ^ "The human proteome in liver - The Human Protein Atlas". www.proteinatlas.org. Retrieved 2017-09-21. ^ a b Lade AG, Monga SP (2011). "Beta-catenin signaling in hepatic development and progenitors: which way does the WNT blow?". Dev Dyn. 240 (3): 486–500. doi:10.1002/dvdy.22522. PMC 4444432  . PMID 21337461. ^ Berg T, DeLanghe S, Al Alam D, Utley S, Estrada J, Wang KS (2010). "β-catenin regulates mesenchymal progenitor cell differentiation during hepatogenesis". J Surg Res. 164 (2): 276–85. doi:10.1016/j.jss.2009.10.033. PMC 2904820  . PMID 20381814. ^ Schweitzer A, Horn J, Mikolajczyk RT, Krause G, Ott JJ (2015). "Estimations of worldwide prevalence of chronic hepatitis B virus infection: a systematic review of data published between 1965 and 2013". Lancet. 386 (10003): 1546–55. doi:10.1016/S0140-6736(15)61412-X. PMID 26231459. ^ a b "Global, regional, and national incidence, prevalence, and years lived with disability for 310 diseases and injuries, 1990-2015: a systematic analysis for the Global Burden of Disease Study 2015". Lancet. 388 (10053): 1545–1602. 2016. doi:10.1016/S0140-6736(16)31678-6. PMC 5055577  . PMID 27733282. ^ Dény P (2006). "Hepatitis delta virus genetic variability: from genotypes I, II, III to eight major clades?". Curr. Top. Microbiol. Immunol. 307: 151–71. PMID 16903225. ^ Hirschfield, GM; Gershwin, ME (Jan 24, 2013). "The immunobiology and pathophysiology of primary biliary cirrhosis". Annual Review of Pathology. 8: 303–30. doi:10.1146/annurev-pathol-020712-164014. PMID 23347352. ^ Ghent, Cam N (2009). "Who should be performing liver biopsies?". Canadian Journal of Gastroenterology. 23 (6): 437–8. PMC 2721812  . PMID 19543575. ^ Chu, Jaime; Sadler, Kirsten C. (2009). "New school in liver development: Lessons from zebrafish". Hepatology. 50 (5): 1656–63. doi:10.1002/hep.23157. PMC 3093159  . PMID 19693947. ^ An argument for the ancient Greek’s knowing about liver regeneration is provided by Chen, T. S.; Chen, P. S. (1994). "The myth of Prometheus and the liver". Journal of the Royal Society of Medicine. 87 (12): 754–755. PMC 1294986  . PMID 7853302. Counterarguments are provided by Tiniakos, D. G.; Kandilis, A.; Geller, S. A. (2010). "Tityus: A forgotten myth of liver regeneration". Journal of Hepatology. 53 (2): 357–361. doi:10.1016/j.jhep.2010.02.032. PMID 20472318. and by Power, C.; Rasko, J. E. (2008). "Whither prometheus' liver? Greek myth and the science of regeneration". Annals of Internal Medicine. 149 (6): 421–426. doi:10.7326/0003-4819-149-6-200809160-00009. PMID 18794562. ^ Krishna, Gopi; Hillman, James (1970). Kundalini – the evolutionary energy in man. London: Stuart & Watkins. p. 77. ISBN 1570622809. Archived from the original on 2016-03-05. ^ Yuan, Shaochun; Ruan, Jie; Huang, Shengfeng; Chen, Shangwu; Xu, Anlong (2015). "Amphioxus as a model for investigating evolution of the vertebrate immune system" (PDF). Developmental & Comparative Immunology. 48 (2): 297–305. doi:10.1016/j.dci.2014.05.004. Archived from the original (PDF) on 2015-12-22. ^ Yu, Jr-Kai Sky; Lecroisey, Claire; Le Pétillon, Yann; Escriva, Hector; Lammert, Eckhard; Laudet, Vincent (2015). "Identification, Evolution and Expression of an Insulin-Like Peptide in the Cephalochordate Branchiostoma lanceolatum". PLoS ONE. 10 (3): e0119461. doi:10.1371/journal.pone.0119461. PMC 4361685  . PMID 25774519. ^ Escriva, Hector; Chao, Yeqing; Fan, Chunxin; Liang, Yujun; Gao, Bei; Zhang, Shicui (2012). "A Novel Serpin with Antithrombin-Like Activity in Branchiostoma japonicum: Implications for the Presence of a Primitive Coagulation System". PLoS ONE. 7 (3): e32392. doi:10.1371/journal.pone.0032392. PMC 3299649  . PMID 22427833. This page was last edited on 12 August 2018, at 10:19 (UTC).